Dish TV’s NEW 55” Widescreen Ultra HD LED TV not only gives you great picture and sound delivering an astounding HDTV experience, but also modern styling and quality finish. Whether it’s for the living room or the second room, the 50Hz Full HD picture quality delivers outstanding bright, rich colors for the whole family. USB 2.0 allows simple high-speed delivery of movies from your USB drive directly to your TV, including options for music playback & image viewing. Ultra HD TVs are more than double the picture definition of HD TVs, giving you a very clear image in larger screen sizes. Details are rich, gradations are smooth, giving you an outstanding picture on your TV. 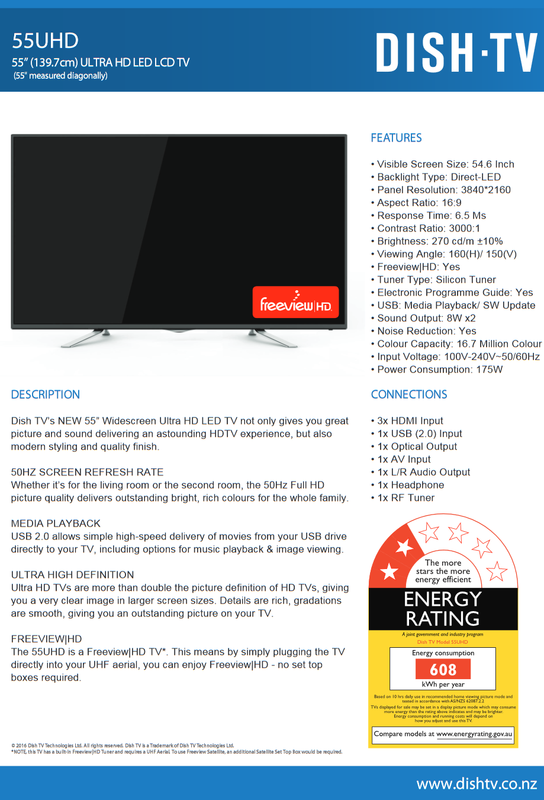 The 55UHD is a Freeview|HD TV. This means by simply plugging the TV directly into your UHF aerial, you can enjoy Freeview|HD - no set top boxes required.